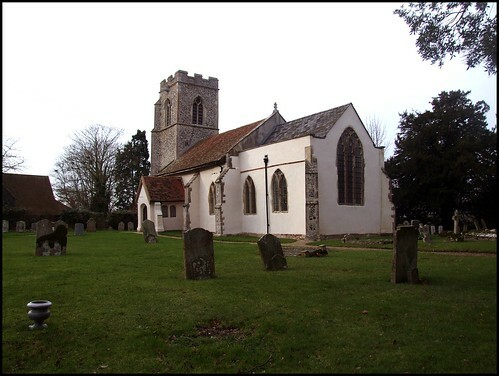 Coming from Bildeston, you can approach St Mary by a reasonably major road. But I prefer to head out of Ipswich through Somersham, and take the country road from Nedging Tye, near Naughton. This brings you eventually down into the Nedging Hall estate, with this ancient building by the gatehouse. The ninety degree turn in the lane reminds us that, until the 20th century, the road system fitted in with the Suffolk countryside, rather than the other way around. Among the sylvan glades that abound in these hills, St Mary's neatly clipped graveyard is a bit startling, its domestic starkness accentuated by the way the graves have all been moved into neat rows to the west. The tombchests appear to have collected in one corner of the graveyard as if they had drifted there like boats in a high wind. You see this again and again in England. Why did people do this in the 1960s and 1970s? To make mechanise mowing easier? To make more room? Or was it a collective neurosis at work, a modernist world trying to capture and tame the past? Whatever, I'm glad we've stopped doing it. St Mary presents a delightful combination of a basic, largely 13th century village church, and the Gothick trimmings that 18th century landowners liked to impose for the sake of a view. The chancel appears to have been stolen from a college chapel, its parapets built up into self-confident substance. Around the north side is a revelation of the church's true age, a lovely Norman doorway. 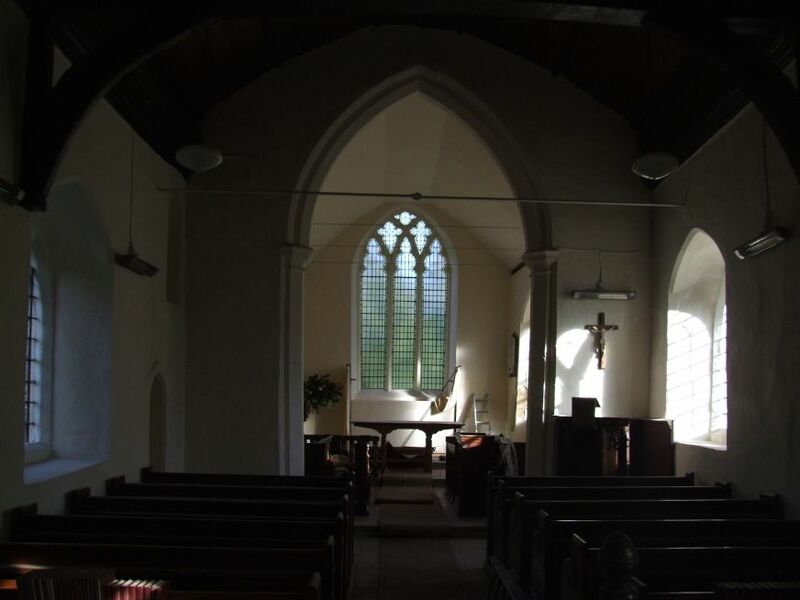 Inside the church, fortunately, the rustic theme continues rather than the Gothick one - everything is plain and simple, a reasonably restored, pleasantly rural ambience that generations of villagers would recognise. I liked it immediately. I remember the first time I came here, back in 2001, the paving stones cool and fresh on a humid early summer day. Then, I'd run my hand along the back of the crisp, simple Victorian benches. 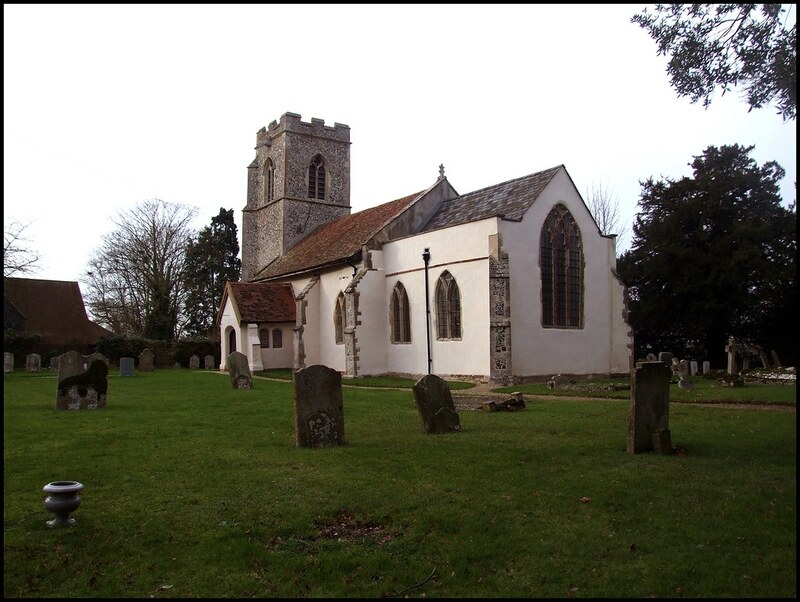 On a cold day in early 2008, the church still suited, and had in any case undergone large and expensive repairs since I had last seen it. Everything is understated, prayerfully simple. 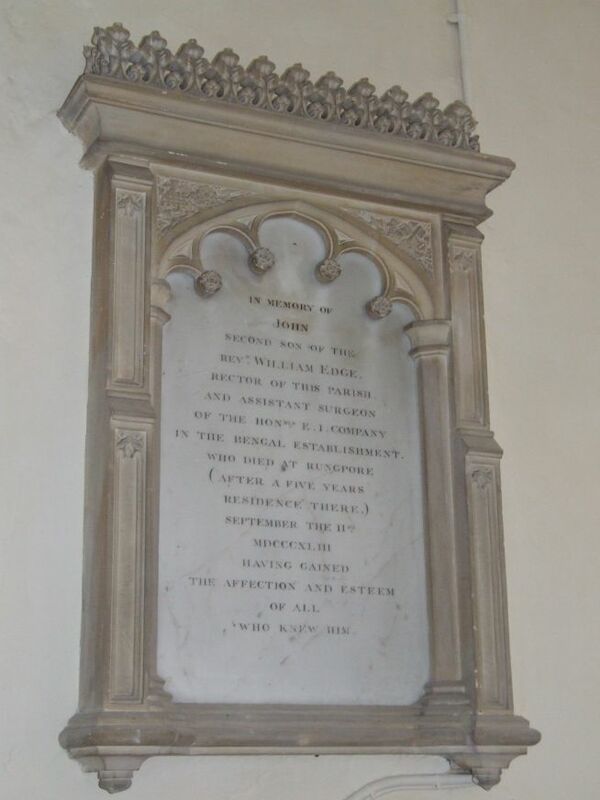 Even the medieval font is plain. The English altar, in the Sarum style, really suits it. Toward the west, there are some fascinating survivals; medieval benches with carved ends. These are badly mutilated, but enough survives to be asked questions about. Some appear to be towers, with figures protruding from the top. One recalls the towers at Tannington and Kettleburgh. 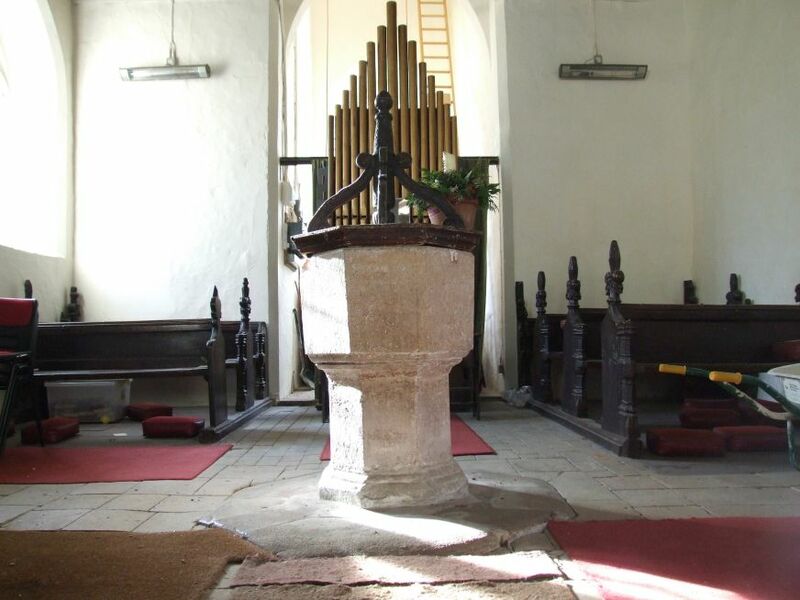 Or could it be a pulpit, like that at Barningham? Others appear to be the mutilated remains of fabulous beasts; a tail curls, tantalisingly, in the manner of some creature from a bestiary. These are sadly neglected, but intriguing nonetheless. On this winter day, nearing the end of my bike ride down from Stowmarket in a slow, stopping curve to Ipswich, I paused for a moment, still in the silence. Suddenly, I heard a bang from the porch, and a loud clanking. I recognised the sound of a key being turned in a lock. I scurried out into the porch, which is windowless, and was pitch black in the late afternoon. I tried to open the door, but of course I couldn't. I shook it hard, and shouted, but nobody answered. All I could hear was my own breathing. Thinking I would need to call my wife so that she could look up the number of the churchwarden, and incidentally explain my delay in getting home, I reached for my phone. But then I thought for a moment, and reached down and just unbolted the doors. They pushed outwards, and the sunlight and cold air flooded in. I breathed with relief, looking up the path, but there was no one in sight. I looked down at the door. It hadn't been locked at all. The noise must just have been a gust of wind slamming the door. I could see why I hadn't been able to open it - the lever has no handle on the inside, and was almost impossible to lift out of its groove in the dark. Standing in the graveyard, I listened to the birdsong, and thought of Spring coming again, And here, you cannot tell quite how close the modern world has encroached. The curious modern tower of St Mary Magdalene, Bildeston, signals from an adjacent hill. Boilings of trees hide the fact that this parish has melted into the edge of that town. I descended the steep hill into Bildeston itself, and civilisation.